A few years ago i bought a Kodak Instamatic off Ebay and took a number of photos in the venerable 110 film format which takes the form of a handy cartridge. Then i dropped the camera in the mud at Plantbrook Nature Reserve and the camera went a bit funny. For a few years i got sidetracked and did not complete my film in that camera but earlier this year i decided to finish the film off (which i was unsure if it still worked or not) and also buy a second Instamatic (a model 91 so older than the other one which is a model 400) and try some new film, made by Lomography no less. And i got the results back last week. Some of the photos are really pretty interesting. Both cameras work fine (though the older Instamatic sometimes needs coaxing to move onto the next frame) so i will continue to use both in future. 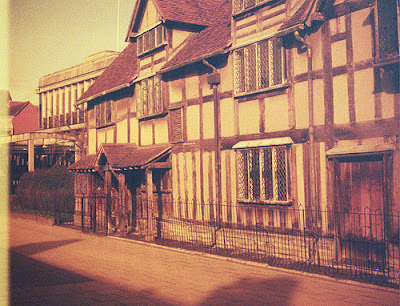 The Lomo film was Lomography Lobster Redscale 110 which gives everything a reddy tinge, it also adds a period feel to photos such as the one of Shakespeare's birthplace below, which looks like it might have been taken in the 19th century but in fact was was taken on February 1st 2013! I have a black and white Lomo film ready for use next. I could of course just use an app like Instagram but where is the fun in that? Well there is fun but its different. In this world of instant gratification there is something nice about taking a photo but not knowing for weeks or months if it actually turned out. Of course this can be annoying when you find the photo turned out a blurry mess.